1. Rabbit fur loss is not necessarily a cause for concern. Remember that rabbits shed their coats twice a year. Some even seem to shed all the time due to inbreeding, bad lighting, or a disruption in the sleep cycle. 2. Rabbit skin problems can include cancer, abscesses, viral warts and other irregular growths that must be surgically removed by a vet. Watch for any changes in your rabbit’s lumps and bumps so you know when or if to take it in. 3. Some cases of rabbit hair loss are caused by parasites (fleas, mites, lice, and fungus) that infest your rabbit’s fur, causing discomfort and extreme shedding. Things like mange, ear canker, ringworm, feather mite and rabbit fur mites should be treated as soon as possible. 4. You may not think of your rabbit’s dental hygiene as an important consideration in its care, but one of the leading causes of hair loss around the mouth and chin is dental problems. 5. 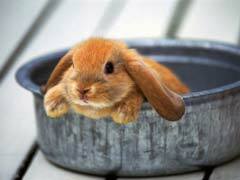 Bacterial infections are common rabbit skin problems for those living in warm and humid climates. Hair loss is not always something to worry about. Keep in mind that, because rabbits are such fastidious groomers, they often swallow a lot of hair during the shedding seasons and can have a hard time passing it. Feeding rabbits plenty of water and keeping them on a well-balanced diet will help them clear their systems.